I recently ran across this idea of a super Bloom in Death Valley. These beautiful yellow flowers are sprouting all over this desert whose very name qualifies it as a place where nothing lives. How cool is that? It only happens when circumstances are just right, but when everything is in its place, these bright yellow flowers pop up, carpeting the floor of the desert with a show hundreds flock to see. And it made me immediately think of how great our God is. Only he can bring life from something dry and barren--and not only life, but beautiful life. Something so alluring people can't help but be drawn to it. This is what he does in our lives. When we think nothing is happening. When all we see is dried up dreams or brokenness, God is getting ready to show off. Everyday blooms draw our attention, for sure, but when something blooms out of brokenness there is a special sweetness to it. The impact is so much greater. The reach so much larger. But it can't happen unless everything is in the right place. That means we need to stay rooted in him. We need to allow the seeds of his truth to fall into the cracks and settle, giving them room to sprout. We need to stay patient, knowing that he is more than able to bring this harvest. And when he does, we need to be thankful and enjoy the beauty of it. 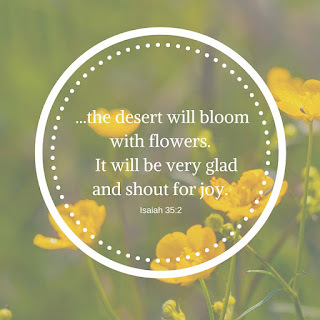 Praying the blooms in your desert will burst into life soon.